How Long Does a Giraffe Live? There’s no taller animal on Earth than the giraffe: A full-grown male, or bull, may stand 18 feet above the ground. These towering, knobby-legged browsers, found across a shrunken and fragmented range of sub-Saharan Africa, certainly rank among the most distinctive-looking of all mammals, but scientists aren’t entirely settled on the evolutionary purpose of some of the most conspicuous giraffe adaptations. They allow giraffes to keep better tabs on other members of their group and potential predators. We casually call the protuberances sticking up from a giraffe’s head “horns,” but technically speaking they’re “ossicones,” sheathed not in keratin like true antelope or bovine horns but in skin. Giraffes already possess ossicones in the womb, though they initially lie flat against the skull. After birth, the ossicone cartilage begins to turn bony. Both males and females wear ossicones, but bulls grow larger and thicker ones and often develop other knobs besides the main pair. The armored skull of a mature bull helps him in clubbing battles with rival males. 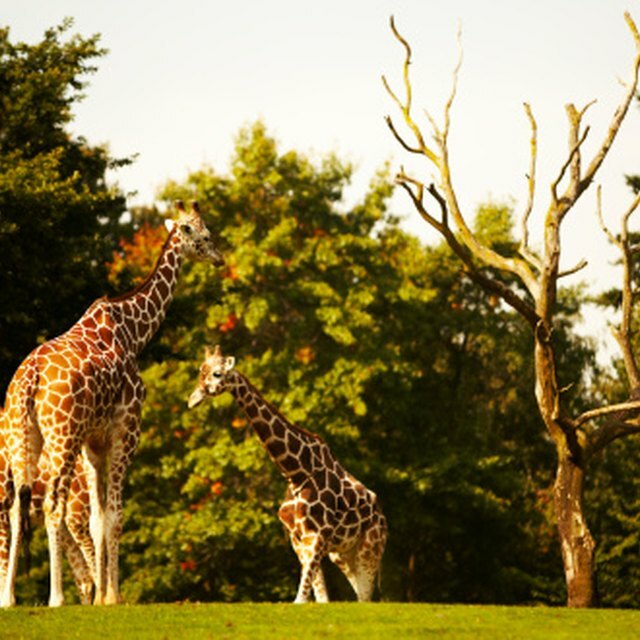 Giraffes don’t use their horns or necks to defend themselves against predators such as lions. Rather, they kick with their hooves, which can be devastating weapons when they land direct blows. Its legs and neck aren’t the only impressively long features of a giraffe’s body. It also claims a whopper of a tongue, which may be 18 inches or more in length. The tongue can also grasp; in other words, it’s prehensile. That ability – coupled with the tongue’s impressive reach and its tough skin – allows giraffes to selectively browse, plucking leaves from among the nasty thorns brandished by many of its preferred food trees, such as acacias. Wielding that dexterous instrument, giraffes can really pack it in. They may consume close to 80 pounds of forage per day. A giraffe tongue is purplish or blackish in color, which may or may not be an adaptation for sun protection. The large dark patches or spots decorating a giraffe’s hide vary from individual to individual and from subspecies to subspecies. These markings may camouflage a giraffe from lions or spotted hyenas in heavy woodland and amid dappled sunlight and shadow, but they also appear to serve as a means of regulating internal temperature in the tropical and subtropical swelter of the African bush. Beneath each patch, complex networks of blood vessels and ample sweat glands dissipate body heat. What Are the Red Panda's Adaptations? Shaw, Ethan. "Giraffe Adaptation." Sciencing, https://sciencing.com/giraffe-adaptation-6326336.html. 23 April 2018.